After putting in a miserably cold first month of training in Seattle, the Hanohano Race in San Diego was a welcome slice of sun and summer weather. The race consisted of an 8.5km flat water short course and a 12.5km ocean long course with only an hour of rest between. 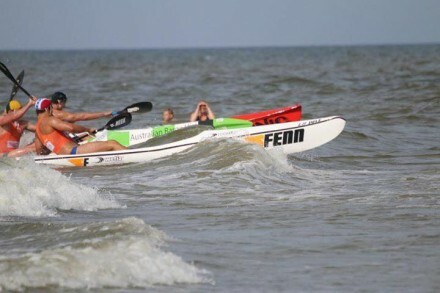 With a handful of fast doubles and the reigning surfski Surf Lifesaving World Champ, Tim Burdiak, on the registration list, I was fired up for a challenging day of racing. The short course started off fast! The local sprint club had come out in force and they roared off the line, pulling the pack for a blistering first kilometer (km). After that, things began to settle down and Tim, a K2, and I managed to break away from the pack. We tussled for two more km, probing each other for weaknesses, until I got an inside line on a turn and made my move. Early I know, but the other two boats were forced wide by the turning radius of the K2. I made the most of the gap and immediately put the hammer down. After about a 5 minutes, I checked over my shoulder and saw that the other boats had opted to work together to reel me in rather than chase me down immediately. Game on. To spare you the boring details, the rest of the race was a head down time trial to keep a lead that I only just managed to hold all the way to the finish. After an hour respite, a few protein bars, and some time in the sun, it was time for the long course. Most of the field (plus some new fast doubles) lined up for the second portion of the Hanohano Race. The hour-long course in the ocean didnâ€™t offer much in the way of helpful downwind, but there was plenty of chop to keep you on your toes. I opted for a more conservative start, not knowing how I would fair in the chop after so long away from the ocean. Right off the line I found myself surrounded by two of the fast doubles I had spotted on start list. When I managed to pulled away from them, I thought I was out in front, but I was sorely mistaken. Two boats (Tim and a new double captained by Rich Sprout) had taken a much deeper line and while they werenâ€™t necessarily on a direct course to the turn buoy, they were a good 200m ahead. It took everything I had to reel in Tim by the first turn buoy (about a third of the way into the race) and for the next few km I pulled out my bag of tricks to work my way past him. We had quite the battle in the chop, his nose staying just ahead, but when general confusion finally lined up in a tiny section of downwind, I made my move. I inched ahead and worked every wave I could to open up a gap. Then I set my sights on the next rabbit, chasing down the leading double. Try as I might (and convinced i ate a lung in the process), the illusive double was able to hold me off and finish just 15 seconds ahead, claiming the overall Hanohano title. All in all, it was an incredible day of racing and a wonderful way to kick off my 2017 season. Cant wait to be back in sunny So Cal for the NAC Race in two weeks time. Happy paddling and good luck with the early season training, wherever you are (even if that means you are sensible and are cross-training indoors).